ALL TRAILS IN THE REGION WILL CLOSE FOR THE SEASON FRIDAY, APRIL 5TH. We thank our volunteers – especially those who drive the groomers for so many long hours. We also thank the many land owners who allow us to use their property for our trails. Without them, the trail system would not be possible. 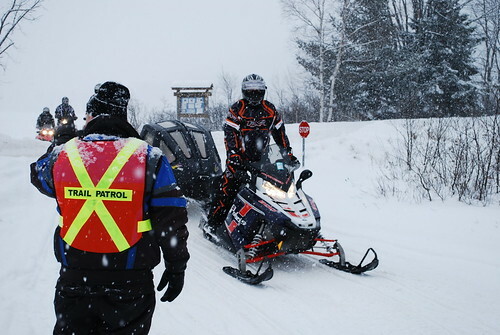 Thanks also to the OPP SAVE Team for keeping our trails safe. Please note: 1) Closed trails means CLOSED TRAILS. Most trails use private property. These private landowner properties are NOT accessible during closed conditions. 2) Spring breakup is a very unsafe time of year as lakes, ponds, swamps and creeks start to open up. Ice conditions are unstable and completely unsafe. We encourage everyone to stay off trails and ice during this very unsafe time. Only 8 months until we start this all over again! We are counting the days! Unfortunately we had to pull the stakes from Trout Lake tonight and have CLOSED the trail 😓 as with that we also had to close trails connecting to the lake. We didn’t want to see this red before the weekend but Mother Nature was not kind today. 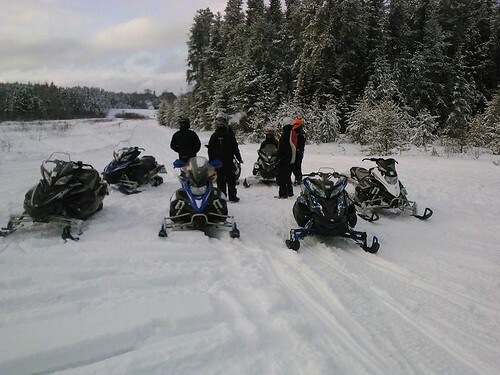 We still have some trails limited but at this point things will likely change rapidly… we are coming to a close shortly but what an AMAZING season we had…. one for the record books. Trails north of the Rock Pine are closed but they are open for business this weekend. Camp Conewango has closed their Restaurant for the season however you still have gas available. Please check the ITG before riding as things change quickly. Spring is in the air, but that doesn’t mean that riding is over. 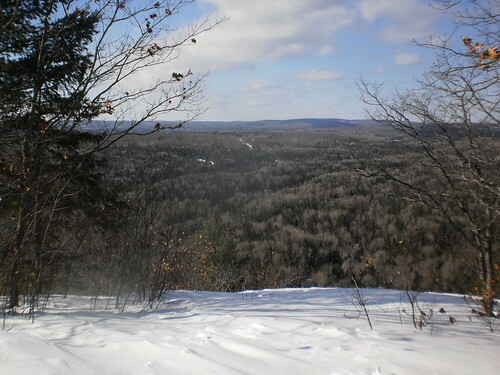 Some of the best trails (and temperatures) are available right now! Not all trails are open, so you’ll need to plan your route appropriately to avoid closed or unsafe trails. 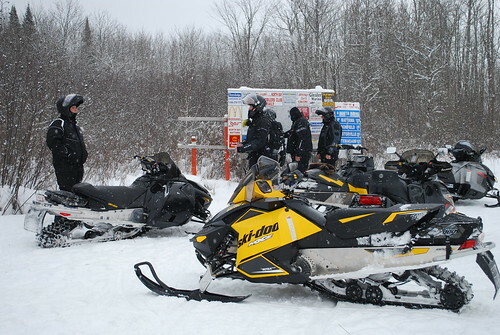 But there are still some great groomed trails, destinations and loops to ride. Click on the OFSC map link to see what’s still available. The fat lady might be practicing, but she’s not singing yet. Hit the trails for one last blast this week! Unfortunately we are having to close a portion of NB 300 to much water & it keeps rising. 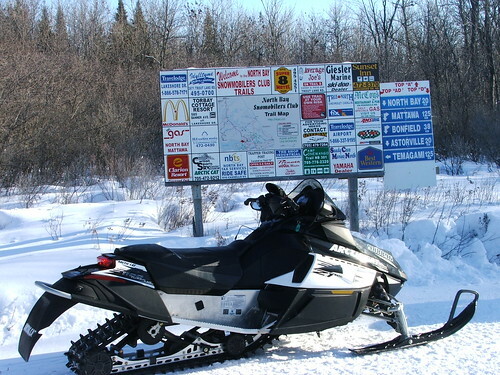 Closed trail signs have been posted. Please do not use as this trail is also on private property. ITG map will be updated accordingly. We are in that part of the season where things can change rapidly. 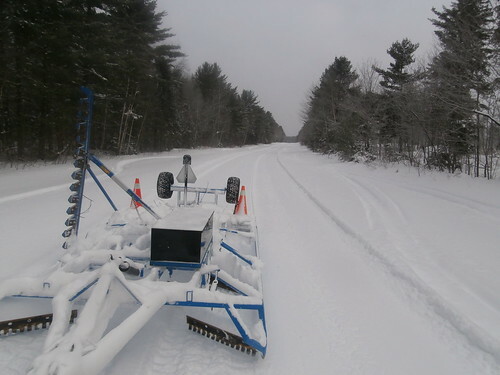 We groomed most of our trails Wednesday night prior to the rain we received Thurs Night. Due to the rain & milder temps we have turned a portion of our trails to yellow status in areas that access lake crossings due to slush on the lakes. ITG has been updated however app may take awhile to show changes. Please ride to the conditions & continue to watch for any other changes. We are hoping for some colder weather to firm things up again. FYI milder weather has made the waterhole developed again on the A102Q where trail & logging road meet. Please be mindful of area until we can repair. The weather is definitely not cooperating so other issues may develop as well. Ride with caution in these types of conditions. Starting to plan your next weekend ride with in our district? Consider joining in on North Bay Cycle & Sports 1st Poker Ride in support of NBRHC Cancer Care, Close to Home campaign. Let’s do wait we can to support our great hospital.